Since the last two campouts have been "hike in", I had forgotten how wonderfully easy and convenient "car camping" can be. While we had close to a one-mile hike in to our campsites at Charit Creek last month, and a half-mile with the Scouts at Camp Buck Toms, here at Norris Lake we can park right at the "Rustic Campsite". Packing was greatly simplified (grab all three TuffBins of camp gear, put in bed of truck). Sleeping is more comfortable with the raised queen-sized air mattress. 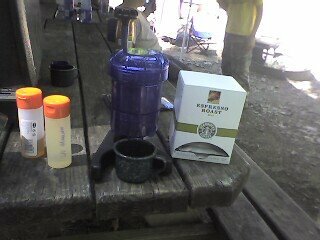 And breakfast includes campsite espresso (see photo above)! Which is exactly what I needed to spool me up for a pickup game of flag football with nearby campers. Today we'll hike and swim, then return home tomorrow for an afternoon Memorial Day cookout. Espresso while camping?! My God, man! Such sacrilege will certainly anger the camping Gods who require a strict adherence to absolute discomfort during this ritual. Might I suggest atonement through pitching tent on ground lousy with tree roots and gravel? LOL! I would expect a General of the Hordes (who conquered the steppes of Asia with only the gear that could be carried on horseback) to be aghast at my camping creature comforts. Alas, the Camping Gods would be pleased to know that my tent was indeed pitched over a stump on rocky terrain. And were it not for the raised inflatable mattress, I might have been a tad uncomfortable!